You are moving into (most likely) a cool apartment, and/or have perhaps bought it. You are really excited about having your own place, but there is one major problem. You need to cook, and the kitchen is tiny. Expanding is not an option, and you have no idea how you are going to make that space work for you. Never fear, because RTA kitchen cabinets are the answer! The first thing that you need to think of is the design of the kitchen. This can easily be begun by getting all of your measurements, and putting them into the online kitchen design tool available at RTA Cabinet Store, here: https://www.rtacabinetstore.com/assets/html/plan/intro/intro2.php. You can also take advantage of a free design consultation. It can really help you get where you need to be. Make sure that the RTA kitchen cabinet line fits in style-wise with the rest of your house. As far as different sizes go, any line will do, as almost all of them have many sizes and combinations of cabinets to choose from. By getting the right appliances, you can really change the way you cook and save a lot of space. For example, do you REALLY need four burners, or will two do? Most of us never use more than two at a time, anyway. With the money you save on cabinets, you can afford to get the best appliances money can buy, including one of those new ovens that is a space-age combination of oven and microwave, and uses a computer to cook your food like a master chef! And you save space by not having two appliances. Rev-A-Shelf can revolutionize your storage space. Installing a Rev-A-Shelf pantry set can give you up to five times the amount of storage space you would normally have in a cabinet! Think about it, for every two cabinets, you have approximately 10 cabinets worth of storage space. Storage problem solved! Glideware does the same thing, but specifically for pots and pans. Having a pull-out Glideware accessory installed will allow you to store all of your pots and pans in one place, with no clutter, and be very organized. Your kitchen will seem like it holds a huge amount of things once you combine RTA kitchen cabinets, their accessories, and a little bit of creativity to the problem. Good luck! By the way, are you ready to get that $500 kitchen design consultation for free? 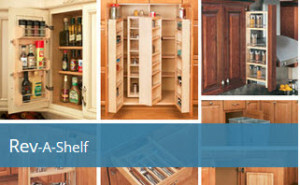 RTA Cabinet Store’s professional design consultants are happy to provide a customized design for your kitchen. Get started here! ‹ Is RTA Cabinets’ Stability Up to Par?